Would you allow your partner full access to your phone? When Baby Uhuru Kenyatta arrived, Freda Shibonje was briefly overcome with emotion and the joy of a mother. Sometime in 1961, as the black majority in colonial Kenya looked forward to independence, the country suffered one of the worst famines in its history. But as the relief of rain came, it ushered in devastating floods that marked an incredible period of contrasts that the National Archives records as “the 100 days of extreme conditions”. Significantly, it was also the year of political uncertainty with suspicion rising that the British colonialists would not keep their promise to release jailed independence hero Jomo Kenyatta. But on August 21, the man who would become Kenya’s first president was freed after nine years in prison. Ms Freda Shibonje recalls the events in 1961 as if they happened yesterday — not a mean feat for an 80-year-old. But it is not the extreme weather conditions or the heady post-independence politics that lights up her face during the interview with the Sunday Nation, it is the birth of a child at Aga Khan Hospital, Nairobi, on October 26, 1961. 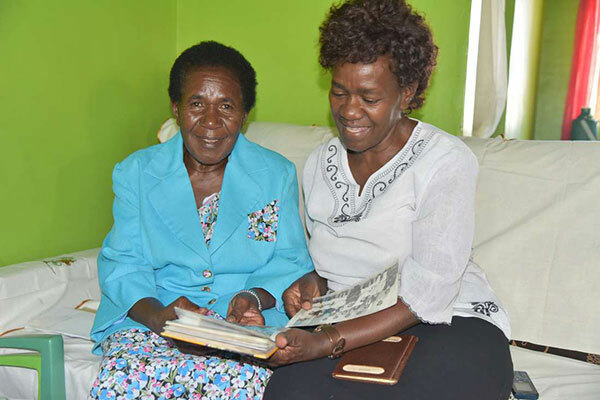 That morning, Ms Shibonje, who had joined the hospital as a nurse in December 1960, was going about her duties at the maternity wing when a VIP patient arrived. She recognised the patient as Mama Ngina Kenyatta, the wife of Mzee Kenyatta. “I was happy for the mother since we had come a long away from the time we started attending to her while expecting the baby and when the moment came for her to deliver, I couldn’t wait to welcome her baby,” Ms Shibonje told the Sunday Nation at her home in Ikonyero village, Kakamega County. She rushed to the lift at the corridor next to the delivery room and met Mama Ngina who was heading to the ward. “I greeted her and given her condition, I went ahead to arrange for her to take some rest on the bed since she looked tired,” Ms Shibonje said, adding that she then proceeded to make preparations for the patient to be attended to during delivery. But outside the ward something else was happening. Mzee Kenyatta and his fellow independence hero Jaramogi Oginga Odinga had accompanied Mama Ngina to the hospital and only stayed briefly. “I saw them in an animated discussion at the far end of the corridor next to the maternity wing and did not appear to be keen to enter the ward,” she said. Just as they had come, Mzee Kenyatta and Mr Odinga left unnoticed shortly after Mama Ngina had been admitted. That day, Ms Shibonje was among the medical staff in the room when Baby Uhuru Muigai Kenyatta was born, she recalled. Almost 57 years later, it is a moment that the mother of six who has retired to a quiet life in the village still cherishes. “When the baby arrived, I was briefly overcome with emotion and the joy of a mother. I quickly picked him and held him in my hands, happy that everything had gone on smoothly,” she said, adding that at the maternity wing, she worked with nurses Naomi Muthoni and Mary and a Dr Joshi, a gynaecologist. Mama Ngina would later become the First Lady after her husband was elected Kenya’s founding president. As for the baby boy born that October, he is the current president. “Whenever I see President Kenyatta on television screens, memories of the day I witnessed his birth come flooding back into my mind. As a mother, I have been praying and hoping that one day I will get the opportunity to meet him and shake his hand,” Ms Shibonje said. Back to the encounter at the hospital’s maternity wing, Ms Shibonje said the atmosphere was calm with very little activity going on when Mama Ngina arrived. The retired nurse remembers that the room in which Mama Ngina was admitted had two beds. For privacy, that part of the maternity wing was reserved for expectant mothers from influential families and Ms Shibonje usually worked there. On the day Mama Ngina was driven to the hospital, there were no prior arrangements she would be accommodated at the facility. Ms Shibonje knew Mama Ngina from earlier antenatal care visits. “I had attended to her before but on this day we said very little to each other. I doubt whether she can recall my face or recognise me,” she said. “She was a very reserved person and said very little, making it difficult to start a conversation with her. But we got along without difficulty since all I had to do was to ensure she was comfortable during her stay at the maternity unit,” Ms Shibonje added. The retired nurse said she later heard Mzee Kenyatta visited the hospital in the afternoon after learning of the delivery. The Nation also reported that as Mzee Kenyatta left a meeting at Broadcasting House for the hospital, he said he did not know whether the child was a boy or a girl. And how did he feel about becoming a father again at the age of 71. “Very happy,” Mr Kenyatta answered with a deep chuckle. Ms Shibonje said many other friends of the former First Lady visited her without going through any security checks. “Everything went on normally at the time Mama Ngina and her baby were at the hospital. They were served food cooked at the hospital and there were no changes which were introduced because of their presence in the ward,” she said. When Mama Ngina finally left the hospital, it was the last time Ms Shibonje met the former First Lady or any close member of the family. In an interesting twist, last November, President Kenyatta and First Lady Margaret were at Aga Khan Hospital for the birth of their grandchild. They later posed for photos with doctors and midwives who ensured the safe delivery of Baby Wanjiru — the daughter of the President’s son Jomo and wife Fiona. On Friday, the Aga Khan Hospital management declined to disclose any details regarding Ms Shibonje’s time at the facility, saying it would be in breach of hospital-patient confidentiality rules. “I took your request on details regarding the nurse to the management and was told that we are not allowed to reveal patient details,” communications officer Duncan Kioko told the Sunday Nation. Over the years, Ms Shibonje remembers attending to the wives of former Cabinet ministers James Gichuru and John Michuki. “I knew they were wives of important people because of the records we kept after they delivered,” she said. There were also prominent Europeans and Asians who brought their spouses to deliver at the hospital, she observed. Ms Shibonje finally left Aga Khan Hospital in 1967 to proceed for further studies and training in midwifery at the Neath General Hospital in Britain. Her three-year stint in Britain was arranged by a colleague who was a doctor at the hospital. She returned to Kenya and was deployed to then Kakamega Provincial Hospital, which has been renamed Kakamega County Referral Hospital, where she worked from 1970 until her retirement in June 1993. Born in 1938 in Ebusikhobo village in Shinyalu, Kakamega East Sub-County, she attended Musingu Mixed Secondary. “We were just four girls compared to 160 boys at the school. The times were tough for girls seeking secondary education but we completed successfully,” she recounted. After her secondary education, she moved to Kakamega and stayed with her uncle who was a doctor at the Kakamega Hospital. “I got a lot of encouragement from my uncle who had a lot of hope in me if I was given the opportunity to pursue my dreams by studying midwifery,” she said. But perhaps what drove her to take up a nursing career was the death of her aunt after she developed complications during delivery. “I was so devastated by the death. That is how I decided to take up midwifery as a career so that I could help other pregnant women to deliver safely. This is what I have been doing the whole of my life,” she explained. Three of her daughters — Florence Siva, Janet Mukoshi and Christine Shibonje — chose to follow in her footsteps. Florence is a nurse at St Mary’s Mission Hospital in Mumias while Christine works at Jaramogi Oginga Odinga Teaching and Referral Hospital in Kisumu. Ms Mukoshi, the sixth born in the family, is pursuing a PhD in nursing at Nairobi University. “I did not influence my daughters to go into nursing as a career. But I’m happy they made the right decision since the work I have been doing as a midwife touched their lives and drove them in that direction. I’m happy they have picked up the baton from where I left,” she said. After she retired in 1993, Ms Shibonje started a health facility at Lubao market in Kakamega to promote a campaign to ensure pregnant mothers attend ante and postnatal clinics regularly and have access to safe delivery. Expectant mothers also flock to her rural home to seek advice. “It is unfortunate that expectant mothers, especially those in rural areas, are still reluctant to deliver in hospitals complaining of being harassed by nurses attending to them,” she said. The death of her husband jolted her plans and she decided to close down the clinic. Her daughter Christine says the passion her mother had in midwifery has remained strong despite her age. “When our mother learns of any case of a pregnant woman in trouble and undergoing complications related to delivery, she does not wait. She will do everything to help the patient and save her life,” Christine said..
Ms Shibonje’s rural home is next to a road near the Ikonyero market, on the outskirts of Kakamega Town, making it easier for those seeking help to reach her during emergencies. She has formed groups through which she has helped train to help save lives by responding to emergencies during deliveries. But she has slowed down the activities to avoid exerting too much pressure on herself due to her age. She spends much of her free time attending to chores at home and working with the community to improve their livelihoods. Perhaps the secret of her happiness has something to do with her enchanting smiles as she talks to her visitors. Fifty-seven years. That is how long she has waited to publicly tell the story of the birth of her famous patient.